LEEDS — Five Boy Scouts from Leeds were honored for achieving the coveted Eagle Scout status Saturday evening. The ceremony took place at the Lott Ranch, a private amusement park owned by Ben Lott tucked away beneath towering cliffs of Silver Reef. 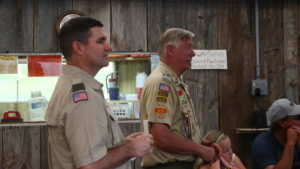 With numerous family members and current and former Boy Scouts looking on, Lott and Stephen Wilson, Scoutmaster of the Leeds First Ward, opened the ceremony. The young men attaining the rank of Eagle Scout were Taren Barlow, Caden Carnley, Kaleb Palmer, Jason Stirling and Jesse Wilson. Each of the scouts was brought forward to speak about the individual projects they had undertaken and completed. The projects were part of their requirement for attaining Eagle Scout. They were required to spend at least 100 hours on each project. Some of the projects the scouts completed were a retaining wall, steps and a wheelchair ramp at the Leeds City Park. Another young man helped construct a treehouse at the Lott Ranch, which is used by approximately 300 people per week. Laying down approximately 7000 square feet of sod at the ranch was another project. 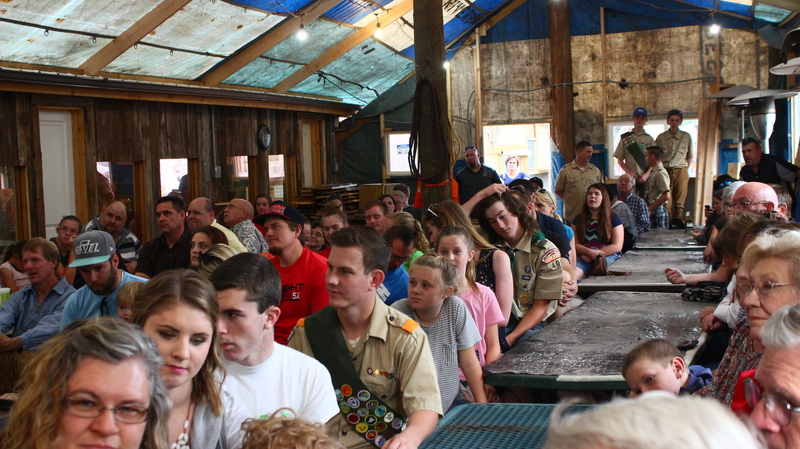 All combined, the scouts spent well over 1000 hours on the project, Lott said. “This is the culmination of hard work, love of family, love of scouting, and an honor to the boy for what he is doing,” he said. Wilson said the ceremony was an important recognition of the many hours of dedication each of the young men had undertaken for the previous five or six years. Perhaps the evening’s most poignant and emotional moment came when Kaleb Palmer received the recognition of those in attendance. As a toddler, Palmer was diagnosed with Nephrotic Syndrome, a disorder that caused his kidneys to fail. He spent much of his childhood undergoing dialysis. His project was to raise money to purchase iPads for the children at the Primary Children’s Hospital in Salt Lake City. He also made approximately 40 fleece blankets to keep the children warm and comfortable. He’s been through a lot. He has had three kidney transplants, was on dialysis himself for five years. So he knows firsthand how hard it is. When we talked about doing his project, of course he wanted to do something that meant something personal. and to help the other kids he knows what it’s like to sit in those chairs and to be hooked up to dialysis. So it meant a lot to all of us. It was important for him to dedicate his time trying to help others, Palmer said. “The reason I did this project is because — as I said earlier — I just know how the kids feel and it really just hit me hard,” he said. The doctors at the hospital have since told Palmer that his work has made the children undergoing dialysis much more comfortable and the experience more enjoyable. 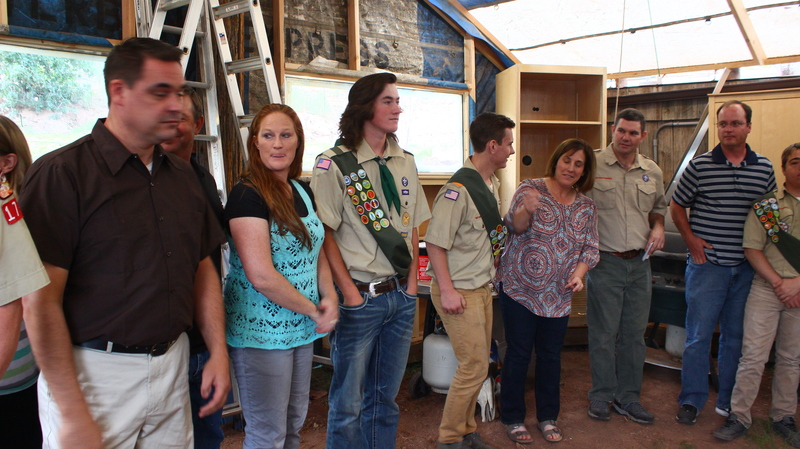 At the conclusion of the ceremony, a dozen or so former Eagle scouts gathered together while the final honors were bestowed upon the newest members of this exclusive club. 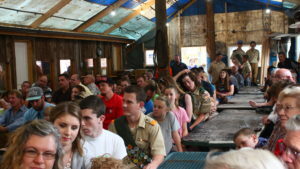 When the last medals and pins were handed out, the former scouts welcomed the Eagle scouts into their ranks in the “Eagles nest”. Congratulations to the new Eagles. Job well done. Great program for youth……tomorrow’s generation.